The Lebanese army says it has located the remains of eight people it believes to be soldiers taken hostage by so-called Islamic State militants in 2014. It comes after a ceasefire was declared on the Syria-Lebanon border, leading to negotiations including talks over nine kidnapped Lebanese soldiers. Lebanese security chief Maj Gen Abbas Ibrahim said that DNA tests would be conducted on the remains. Gen Ibrahim added that the search for a ninth body was continuing. Syrian state media, citing a military source, said on Sunday that a deal had been reached to move IS militants, who have been fighting the Lebanese army on one front, and Hezbollah with the Syrian army on the other, to eastern Syria. "We agreed to a deal between Hezbollah and [IS] which will see the rest of its militants evacuated to the eastern region of the Syrian Arab Republic," Syrian state news agency Sana cited the source as saying. What is Lebanon's Hezbollah movement? The pause in operations enabled negotiations to take place over nine missing soldiers taken hostage when IS jihadists overran the border town of Arsal in 2014, Lebanon's army said. Gen Ibrahim said that the body parts, which were discovered along its border, were likely to belong to the missing soldiers, adding that tests would confirm their identities. The Lebanese Red Cross later drove the body parts through the town of Ras Baalbek in eastern Lebanon on their way to the capital, Beirut. 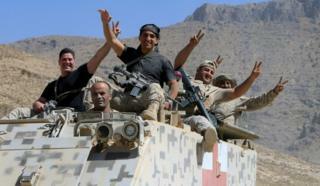 Some 30 soldiers and police had been captured in Arsal, of whom four were killed and a fifth died of his wounds. Sixteen were released in a prisoner swap in December 2015 with Islamist group Nusra Front. The twin offensives by the Lebanese army, and the Syrian army and its Lebanese militia ally Hezbollah, have advanced towards the border from opposite sides. Lebanon's army has been fighting IS near Ras Baalbek, while the Syrian army and Hezbollah have attacked from Syria's west Qalamoun region. Both ceasefires came into effect on Sunday at 07:00 (04:00 GMT). The Lebanese army insists it is not co-ordinating with Hezbollah, which the US classes as a terrorist group. Any such liaison would be politically sensitive in Lebanon, and could jeopardise the US military aid it receives. Last week, Lebanon and Hezbollah each announced they had made significant gains against IS militants, driving them back into a smaller part of the mountainous border enclave. The Lebanese army's insistence that it is not co-ordinating with Hezbollah or the Syrian army flies in the face of recent developments. On the same day as the start of its operations in July, Hezbollah and the Syrian army announced their own offensive from the other side of the border. Between them, the two armies and Hezbollah have had the militants surrounded, and were able to quickly retake most of the territory they held. The ceasefire came into effect today at the same time on both sides of the border. And a few weeks before the battle, Hezbollah fought to clear an adjacent area from another group of militants, and handed over its positions to the Lebanese army. The official position appears designed to manage differences over Lebanon's relationship with the Syrian government, as well as the growing role of Hezbollah in the country.